Nike and Elle have collaborated to stage this 10k running event, only for women. It's on Saturday 18th May (start training now! ), it's in the evening, it's in Victoria Park, and it's linked to training programmes on Nike+ and through content in Elle. 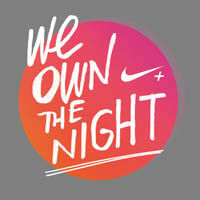 "This summer Nike and ELLE UK are inspiring women across London and the UK with ‘We Own The Night’ – the ultimate after-hours 10K run on Saturday 18th May. Together women will blaze through London’s Victoria Park on a route filled with light, sound and the unexpected for a truly unique running experience. Nike has partnered with ELLE UK, the world’s biggest-selling fashion magazine to create a new running experience that fuses sport, fashion and lifestyle. Having signed up with their friends for We Own The Night, women will join an inspiring six-week personalised training programme. Combining the digital with the physical, Nike will create a truly motivating journey from start to finish. Digitally, runners can track their time, distance, pace and calories burned via Nike+ to get more out of each run. They can make every workout count with the Nike+ FuelBand and Nike Training Club App, and can join Nike communities via Facebook. Each week ELLEUK.com/beauty/running will feature updates from the ELLE Running Club including video tutorials, guest running blogs, need-to-know expert tips, ELLE’s edit of the most stylish running kit, essential dietary advice and much more. Physical classes will include weekly ‘Run with ELLE’ and ‘Train with ELLE’ events across London. These classes provide a chance for women to express their personal style by wearing the most cutting-edge looks and sharing them via @ELLEUK, @ELLEUKrunning and @NikeUK."